King's Chapel was the first Episcopal Church in New England, and is now a Unitarian Church. The society was organized in 1686, and a little wooden church was erected here in 1689. King William and Queen Mary gave the church a pulpit-cloth, and set of plates for the communion table. Kings Chapel was enlarged in 1710, but was taken down in 1749, and replaced by the present building in 1754. George Washington attended an oration here in 1789, and the stone encapsulation of the building was completed in preparation for this event. Kings Chapel is a very quaint and interesting place. The interior, with its high old fashioned pews, its tall pulpit and sounding board, its massive pillars, and stained glass windows, is remarkably historic. 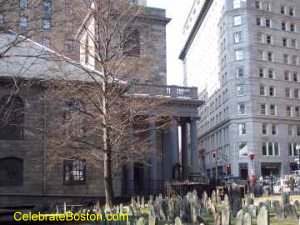 The Kings Chapel Burying Ground is the oldest in the city, though the exact date of its establishment is not known. Situated in a busy part of the city, and crowded into a narrow compass, it is a most interesting place. The cemetery contains the remains of Governor John Winthrop and his son (John The Younger) and grandson, Governors of Connecticut, and Reverend John Cotton. Also buried here are Governors William Shirley and John Leverett, John Davenport, the co-founder of New Haven Connecticut, William Dawes, Jr., who rode with Paul Revere, and Mary Chilton, the first female colonist credited with stepping ashore at Cape Cod. The resting place of Elizabeth Pain is at King's Chapel, whose carved headstone inspired Nathaniel Hawthorne when he wrote The Scarlet Letter. Burials ceased here in 1796 as a general rule. In the early 1800s, many of the gravestones were moved from their original position and placed in rows, so it is impossible to tell the exact location of some of the graves. In olden times a great deal of excitement was caused by a rumor that someone had been buried alive there, but the affair ended uneventfully when the doctor who had attended the deceased testified in the matter.